Lilian started her professional career working both as a model and a corporate lawyer. 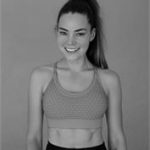 While working in law, her interest in health and fitness developed, and she has since switched her career focus to health & fitness. She runs a healthy living website and is a passionate professional Muy Thai fighter with a a current record of 3-0! When she’s not in the gym or teaching at XO, Lilian works as a freelance digital content creator and recipe developer, and is on the editorial board of FIGHTMAG.